WedSafe, The Magical Glad Hatter, Magenta, Owens-Lugar Photography and Childs’ Play demonstrate their skills on the largest party, wedding and event planning network, PartyPOP.com. 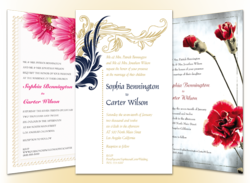 PartyPOP.com recently announced free wedding invitations and an RSVP website for any engaged couple in the United States, Canada and the United Kingdom. The company has re-purposed their 2012 marketing budget in hopes of building brand awareness and loyalty. According to reports from within the Southern California based company, it’s working. PartyPOP.com features over 2 million highly accomplished and professional companies in the event planning industry. Some of these companies include WedSafe, The Magical Glad Hatter, Magenta, Owens-Lugar Photography and Childs’ Play. Founded by a couple who was unsuccessful in finding insurance for their own wedding, WedSafe was created to protect against unpredictable illness, weather, no show vendors, damage to gifts and to the bride's dress. After their wedding, the couple was motivated to provide coverage for other couples in the future. Wedsafe was created in 1999 and is now a top private wedding insurance program in the United States. In December of 2006, WedSafe was acquired by Affinity Insurance Services, Inc. (an Aon company). Affinity handles the day to day operations of the program providing product expertise, program management and superior customer service. The parent company, Aon Corporation, is a Fortune 250 company and the world's largest provider of insurance brokerage services. The wedding event and liability insurance policies are underwritten by Markel American Insurance Company, a company that has been in business for over 50 years. Additionally, WedSafe has been profiled in publications including the New York Times, the Los Angeles Times, the Wall Street Journal, and Entrepreneur Magazine. As the success of the WedSafe program grew, the company heard expanded to other kinds of private events. The subsequent program, Private Event Insurance was established to provide insurance for non wedding private events. Like WedSafe, Private Event Insurance was acquired by Affinity Insurance Services and policies are underwritten by Markel American Insurance Company. More information can be found online at http://www.partypop.com/v/4341782. The Magical Glad Hatter' provides fun and magic for all occasions in the Fort Worth and Dallas area. Ken Stewart (The Magical Glad Hatter) has been providing exceptional entertainment for the children of the greater Fort Worth and Dallas area for an entire generation. For over 30 years Ken has amazed and entertained audiences at daycare centers, schools, churches, libraries, youth groups, special events, for scouts and many birthday celebrations. More information can be found online at http://www.partypop.com/v/4344395. Magenta - Simply Brilliant Events provides professional and affordable event planning and coordination services for special events in Greater Boston, Western Massachusetts, Connecticut and throughout New England. The company specializes in small to mid-size corporate events, private parties, nonprofit galas and wedding coordination services. Magenta offers a simple and stress-free solution to creating an enjoyable event experience for clients and their guests. The company brings the energy, perspective and years of experience to each event but always designs with the client’s vision and style in mind to create an event that truly meets client’s goals and objectives. Additionally, Magenta incorporates modern ideas inspired by world travel and the latest trends in style, entertainment, and food to create sophisticated and memorable events. Other services include full event planning from concept to execution as well as a la carte services to suit specific needs. Whether customers are planning a milestone birthday party, a cocktail reception, a social event, a corporate event, a nonprofit event, a themed gala or need someone to coordinate a wedding day, Magenta helps clients enjoy the planning and the event. Magenta can be found online at http://www.partypop.com/v/4362235. Owens-Lugar Photography serves Roanoke, Virginia. The photographer Beth-Ann Lugar enjoys capturing moments ranging from happy couples to newborns. She shoots studio portraits, on-location portraits, newborns, baby’s first year and boudoir and pin-up. The company’s studio is located in Salem, Virginia and is the perfect space to capture baby bumps, growing families, furry friends, high school seniors, babies and children. Customers will have a massive selection of backdrops and floordrops to choose from for clients portraits. If requested, Beth gladly picks drops for clients after verifying client’s color schemes. On-location portraits can be taken either outdoors or at home at the convenience of the clients. More information can be found online at http://www.partypop.com/v/4349147. Childs’ Play is a fun and safe family activity center with two locations in Las Vegas. The company is a children’s space designed with parents in mind. Childs’ play has an indoor play space with activities for children of all ages that include a children’s toy boutique, a family photography studio and several private children’s birthday party packages to choose from. The company also offers fun educational classes for children. Some of the activities include dance, tumbling, karate, and art classes. “Music Together” also provides a great music program. Parents can enjoy a great sitting area allowing them to socialize with other families, have a cup of coffee, or even be on the computer, all while having the peace of mind that the children are having a good time in a safe and clean space that is fun and exciting. Customers can become a member or purchase a prepaid pass, which provides access during opening hours. More information can be found online at http://www.partypop.com/v/4343887.